Baby Shower Diaper Cakes... how to make them! Baby Shower Diaper Cakes are such a fun addition to any baby shower and so easy to create! They are also a practical gift for the mom to be! Plus they can serve as your baby shower decorations or as a baby shower centerpiece. One fun diaper cake idea is to theme it so it correlates with either the shower theme or the expecting Mom's nursery! 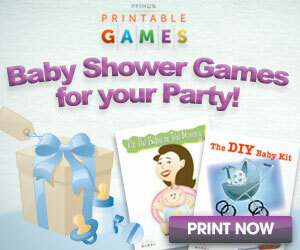 Take a look at her baby shower registry and look at her crib bedding for ideas. Or theme your diaper cake to a favorite children's book and ask all the guests to bring a book to build the baby's library. Check out these two adorable baby diaper cake ideas for our Mom to BEE!! Instead of little toys, we inserted all Burt's Baby Bee products and topped with an elephant Wannanub Pacifier.. they are so great.. the pacifier is attached to the stuffed animal. We made this cute as can be THINK PINK themed diaper cake topped with a little lamb wannanub pacificer that we further decorated with a tutu made of tulle! What was fun about this one was we used a headband around the middle, cute little socks as decorations and a bow on the top tier.. all usable gifts for this special little girl! for a cute topper to your diaper cake! There are lots of different little animals on them. Here are two adorable diaper cake for twins! My daughter's mother and sister-in-laws made these cute "Double Frog" and "Two Teddies" themed diaper cake adding stuffed animals, baby items and blue ribbons and trims to celebrate the impending twin boys!y lucky daughter actually had two diaper cakes at the same shower.. one for each boy! How thoughtful was that! Loved how they decorated with rolled bib clothes and blankets. What a great gift a diaper cake is for the new mom.. toys, baby accessories and all those diapers built into a beautiful baby shower decoration! My girlfriend's daughter made this cute Monkey diaper cake for her sister's baby shower. She has chosen not to learn the gender in advance, so this was just a perfect diaper cake theme for the shower. In addition, she correlated the shower cake to the diaper cake continuing the monkey theme. It couldn't have been any cuter! Here is another cute animal themed diaper cake. One of our visitors submitted this blue Elephant diaper cake for a recent shower for an impending baby boy! All the guests brought elephant or animal themed books to start his library! See more of our own favorite Diaper Cake themes here! Another fun baby shower cake idea is to buy a plain sheet cake and add a cake topper with a matching theme! A friend made our OCT"2"BERFEST cake topper for the twins shower!